Kyoto Animation, or KyoAni for short, has become quite the hallmark name of the industry in the past ten years. Any person getting into anime as a hobby will quickly get acquainted with titles like Haruhi Suzumiya and Lucky Star and K-ON!, names that carry with them great fame and great infamy. Although they’ve had big shows like Chuunibyou and Free!, as well as cult hits like Hyouka and Hibike! Euphonium, they’ve fallen somewhat under the radar in recent years. Nonetheless, they remain a studio with one of the most distinctly recognizable styles in the industry, and immensely talented animators and directors who have a knack for human drama and endearing comedy. 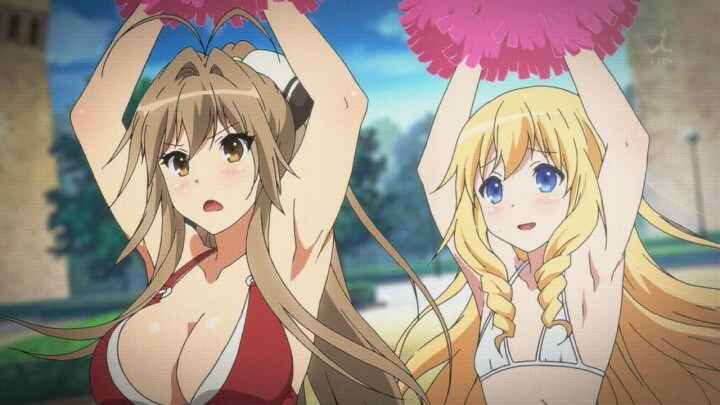 Amagi Brilliant Park is a strong showcase of the latter. It’s a half-whimsical and half-sleazy fantasy comedy from the original author of Full Metal Panic!, another popular series produced by KyoAni, and its charming premise and quirky characters are a good match for the studio. It’s certainly not the most ambitious series they’ve ever done, but it’s fairly consistent at delivering on its mild ambitions right to the finish line. Here’s the premise of Amagi Brilliant Park: Kanie Seiya (named after, hilariously enough, Kanye West) is a former child star and teenage narcissist who gets forcefully dragged along to the titular run-down enchanted theme park by stoic girl Sento Isuzu, who needs his help to save the park from closure and in turn maintain the life energy of the fairies that inhabit it. I think the best way to analyze this show is to analyze the KyoAni quirks that have shown up in its adaptation. The first thing of note is that this is, quite obviously, a pretty looking show. Although KyoAni shows are basically gorgeous by default, the fact that they are doesn’t stop being impressive. Their technical consistency is nothing short of astounding, and it complements Amagi Brilliant Park in its own distinct way by infusing the upbeat playful aesthetic of its character and background designs with the typical KyoAni subdued color palette. It gives the whole thing a delightfully dreamy look that’s very easy on the eyes. Another thing that’s of almost immediate note is the use of the comedic talents of KyoAni. I’ve said before that I’m not a fan of “anime comedy”, but I’ve also said that many ideas are able to work with the right execution. 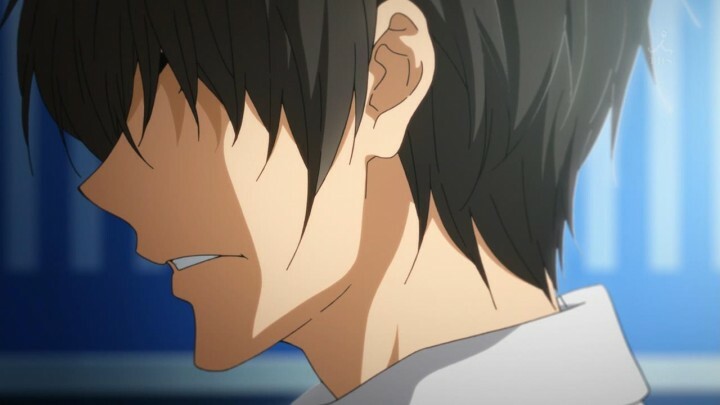 KyoAni have an eye for the timing of their gags, and it shows in Amagi Brilliant Park how they can shape an ostensibly mundane joke into something special. They take something fairly simple like a manzai routine (a Japanese style of straight man/funny man comedy) between Kanie and Sento and elevate it through rapid-fire delivery, while also gracefully sprinkling a handful of quick sight gags in between like the dingy out-of-order toilets and the heavily polluted lakes at the park. KyoAni have an eye for the timing of their gags, and it shows in Amagi Brilliant Park. They also know when to slow it down to deliver laughs, such as in the first exchange between Kanie and Moffle that gradually builds from plain uncomfortable to gut-bustingly violent and hostile. 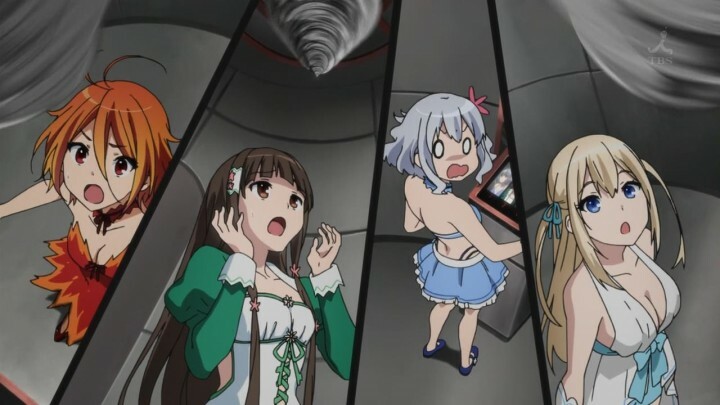 The gag pacing is tight and smooth, and along with the fun ideas of Amagi Brilliant Park and the lovably goofy characters they’re able to build off each other well and deliver the laughs. Although there’s plenty to love, it’s of fair warning to note there’s quite a bit of fanservice in here. Fanservice is difficult to positively appraise, and I could probably name only a handful of anime that are able to use it in a meaningful way. Amagi Brilliant Park is definitely not one of them, but as far as fanservice goes it’s pretty harmless. It’s worth noting that KyoAni is one of the more female dominated studios in the industry, and with most of their shows of the past five or six years they’ve openly taken the very respectable stance of not under-dressing female characters, or putting them in outfits that a regular woman wouldn’t wear. So, as far as overt fanservice goes, KyoAni shows are actually pretty tame (unless you want to debate the sexual undertones of moe, which is a topic for another day). Amagi Brilliant Park is evidently forgoing this general rule, although seemingly reluctantly. Though it does feature scantily clad women, it doesn’t emphasize it in the way you expect fanservice to be emphasized. It usually just presents mid-level shots from the front and back, leaving the rest to your imagination. But…it’s still fanservice. It carries the bad connotations while also not particularly trying to please the audience with it, which puts it in a very weird spot. 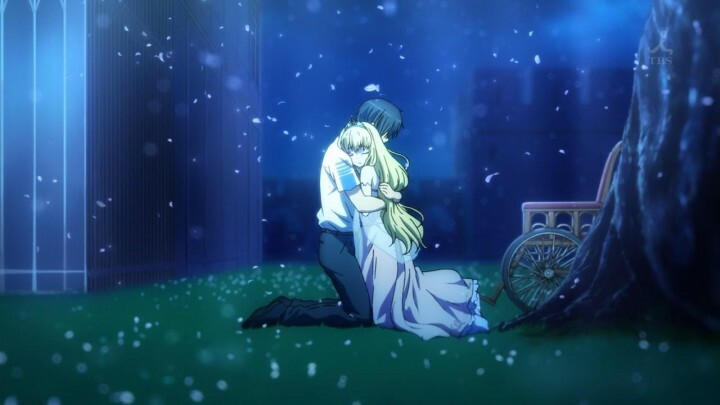 The first act of Amagi Brilliant Park ends with a serious episode, which is respectable enough in conveying characterization and drama but definitely not KyoAni’s best showing. The strengths of this series come from its wackiness, and with the exception of episode four that’s thankfully where its priorities lie in the beginning stretch. Amagi Brilliant Park is off to a solid start! 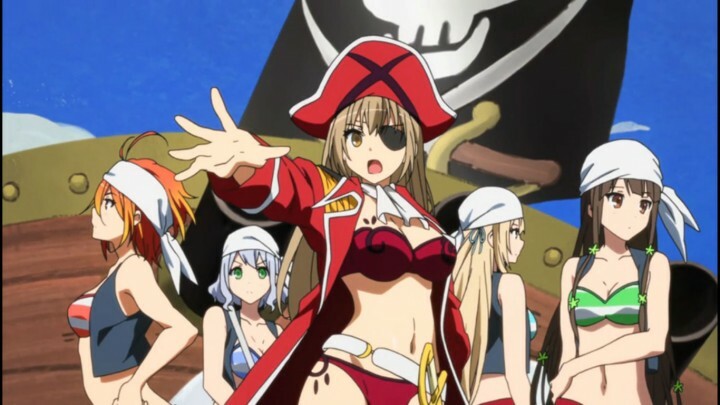 Amagi Brilliant Park’s second stretch settles the series into its comfort zone. Every subsequent episode presents a new set of screwball shenanigans that the park has to overcome, each as silly and charming as the last. 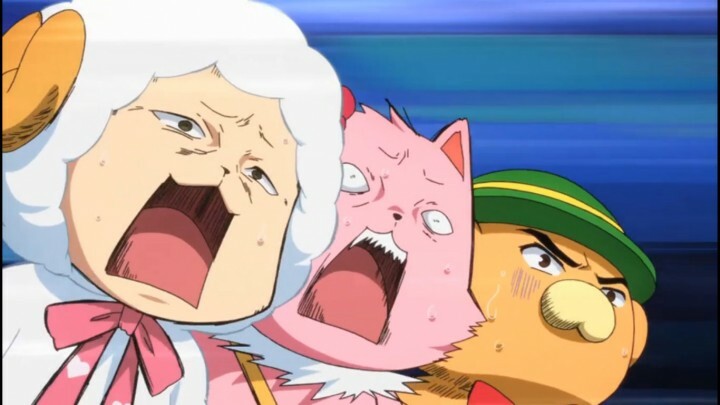 From the simple premise of a job interview to a sea otter pirate invasion to the mascots impersonating Kanie and very nearly destroying his reputation at school, Amagi Brilliant Park is genuinely funny. It knows it’s going for popcorn material, and that’s exactly what you get from it. Take a gag from episode 9, for example, where the Elementario fairies are treated to a meal by Latifa, the princess of the park, in hopes that they’ll bond. Latifa realizes that they’ve run out of soy sauce, and before she leaves the castle to get some more she firmly urges the fairies not to press a button. Of course, as it happens with every comedy, the button gets pressed. That would normally be a fairly cliché but respectable gag, but the punchline here comes from the fact that the time between Latifa leaving and the moment of inevitable temptation was 21 seconds. Yep, a hilariously brief 21 seconds. I counted it. What makes this even funnier is the fact that this button, in plain sight in the dining room of the castle, functions as an insanely high-tech defense system with virtually no necessity. It’s scenes like this, and many others over this stretch, that show the wonderful blend of KyoAni’s sharpness with traditional comedy and the wild ideas inherent in the material. There actually isn’t much more to say about these episodes. I could go through each gag and describe specifically how the ideas and KyoAni’s execution of them work, but it’s just no fun to dissect this silly, silly show like that. These episodes are simply fun. 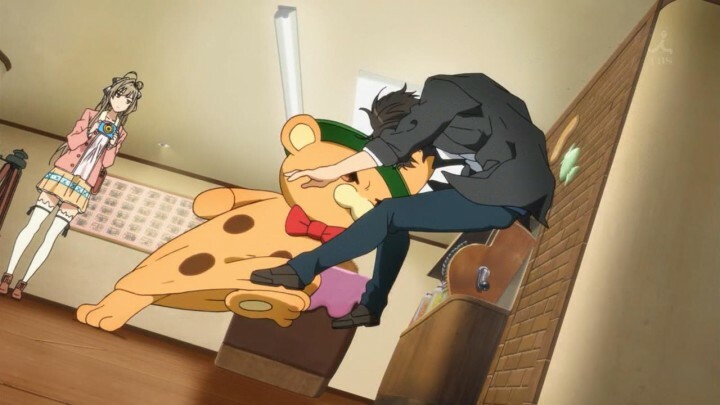 Amagi Brilliant Park is fun. 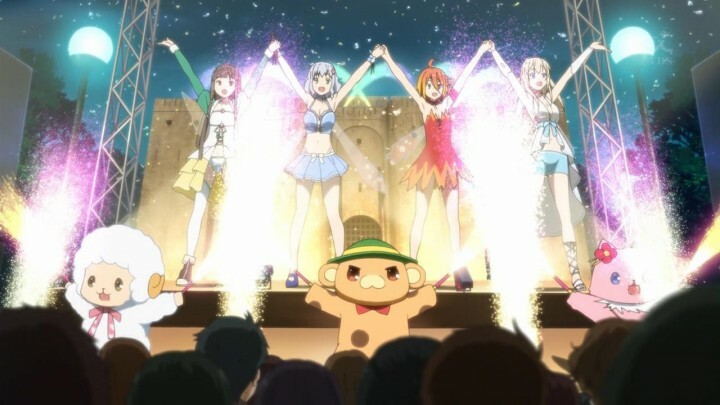 There are many, many better shows out there, but Amagi Brilliant Park is just fine being itself. In its final moments, Amagi Brilliant Park decides it wants to go for a dramatic climax, and it stumbles a bit. As I’ve emphasized several times, Amagi Brilliant Park is at its best as a comedy. It just doesn’t spend enough time doing heavy lifting to build a really profound emotional resonance. With that said, KyoAni finds a way, and it comes out the other end with a fairly respectable conclusion. 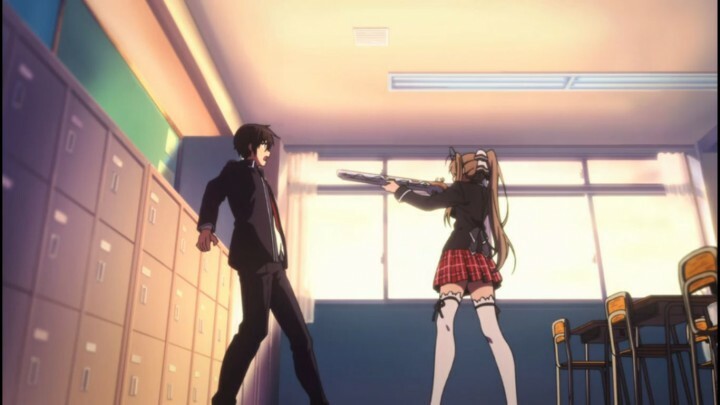 Amagi Brilliant Park stumbles a bit in its final moments. It begins with the revelation in episode 10 that Latifa has a curse which drains her energy, and if the park closes down she might die. In a vacuum this dramatic revelation is executed well, given KyoAni’s talent for crafting character moments, but it falls flat in the broader context of its narrative. The biggest issue here is that we don’t really know Latifa as a character at all beyond a few minor quirks. Moreover, Kanie’s relation to her in the past hasn’t gotten the slightest mention since the first episode, and now that we’re this far in and the series has spent so much time on being utterly ridiculous it’s too little too late to lay it on thick. Luckily, Amagi Brilliant Park manages to make a recovery from its slight dud of an episode, evening out its dramatic tone to fit the mood of the series better. One thing that the series has earned dramatically is an investment in the narrative of Kanie trying to save the park, and it delivers a nice ending to that conflict which is solid at being both suspenseful and rewarding. As for the conflict between Kanie and Latifa, it inevitably didn’t gain my full emotional investment, but it manages to pull off an absolutely stellar dramatic climax between them to top off the series. The story actually concludes before the final episode, and the series finishes on a fairly average comedy episode. With that it leaves things on a fairly comfortable neutral. Kyoto Animation have been behind some of anime’s modern era gems, as well as a fair share of firmly divisive contemporary works. Amagi Brilliant Park fits somewhere in the middle. Although it’s certainly not a bold or daring series by any stretch, and although it has some slight tonal issues here and there, the overall product is a solid and consistently funny series, filled with a strong share of great comedic moments and topped off with absurdly gorgeous KyoAni production. I would sooner look forward to another captivating human drama from the studio, but I certainly don’t mind a fine piece of entertainment like Amagi Brilliant Park.